The name Little "Blue" Heron can be confounding to beginning birdwatchers because first-year birds are white! This is the only heron where one-year old birds look dramatically different from the adults. Little Blue Herons breed in both freshwater and saltwater habitats in the southeastern United States, both coasts of Mexico, the Caribbean, and in northern South America. They spend the winter along the coast of the southeastern United States, the Caribbean, Mexico, Central America, and South America. In Tennessee, Little Blue Herons are a rare nesting species, found in colonies with other herons in West Tennessee. Post-breeding wanderers may be found across the state, especially during June and July. Description: The overall appearance of adults is a dark slate-blue, but the head and neck are actually a dark purple. The neck is long, the legs are long and pale green, and the bill is long and gray with a black tip. First-year birds (June-April) are completely white with a pale, black-tipped bill. When birds are molting into adult plumage (April-June), they show patches of white and blue. Males and females look similar. Tricolored Herons have a white belly, white line down the throat, and white head plumes. Immature Little Blue Herons (last image) resemble other white herons. Snowy Egrets have a black bill with yellow near the eye, and dark legs with yellow feet. Great Egrets are much larger, have a yellow bill, and deep black legs and feet. Cattle Egrets have a yellow or reddish bill, and black or reddish legs, and are much shorter and stockier. Habitat: In Tennessee, Little Blue Herons are found along rivers, ponds, and lakes. Diet: Small fish, amphibians, and aquatic invertebrates. Nesting and reproduction: In Tennessee, Little Blue Herons nest in colonies with other herons along the western arm of the Tennessee River and at several sites near the Mississippi River. Clutch Size: 2 to 6 eggs, with 4 or 5 eggs most common. Incubation: Both adults incubate for 20 to 23 days. Fledging: The male and female regurgitate food for the young, who are able to climb into tree limbs at about 13 days, and are independent of their parents at about 7 weeks. Nest: Both parents build a fairly flimsy stick platform usually above water in a low dense tree or shrub. Nest heights range from 5 to 25 feet above the ground or water. 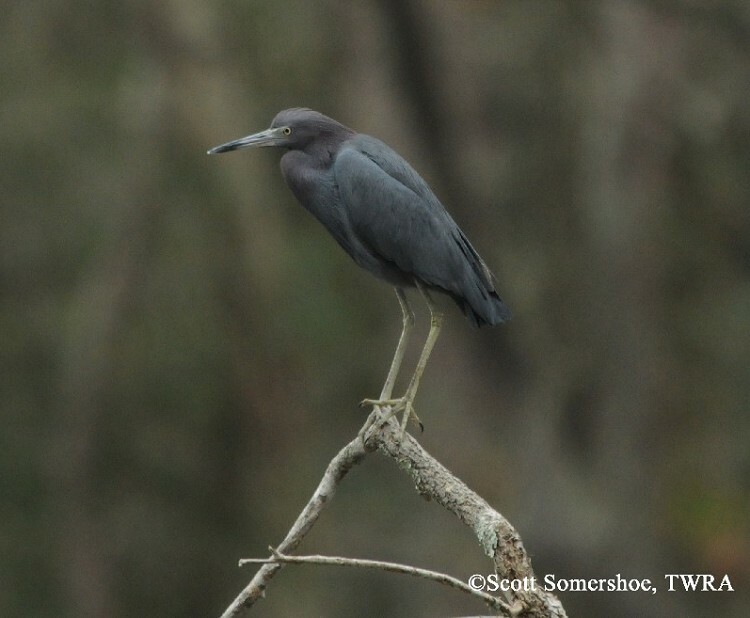 Status in Tennessee: The Little Blue Heron is a rare nesting bird in Tennessee, and all nesting records are from mixed heron colonies along the western arm of the Tennessee River or near the Mississippi River. It arrives in early April and departs in October. In late summer it can occur across the state, especially during June and July, when post-breeding birds are wandering. This species is currently state listed as In Need of Management because of its small breeding population and because it breeds at few colony sites. The Breeding Bird Survey indicates that numbers have been increasing in the state since the 1980's. For some unknown reason, immature (white) Little Blue Herons catch more fish when in the company of Snowy Egrets, than when alone. This may explain why young Little Blue Herons stay white for a year. Because the Little Blue Heron does not have long showy plumes during the breeding season, it largely escaped serious population declines from feather hunting for the millinery (hat) trade. Best places to see in Tennessee: In addition to Reelfoot Lake, the best place to see this species is in West Tennessee during June and July, along lakes, ponds, and rivers. Several pairs nested on Little Elder Island on Woods Reservoir in 2009. Rodgers, J. A., Jr., and H. T. Smith. 1995. Little Blue Heron (Egretta caerulea). The Birds of North America, No. 145 (A. Poole and F. Gill, eds.). The Academy of Natural Sciences, Philadelphia, and The American Ornithologists' Union, Washington, D.C. Consider using the online bird checklist program at eBird to help us understand bird populations and distributions in Tennessee. Click here to see how.